The concept of ‘traditional’ nursing homes is undergoing rapid change and the industry is consolidating. Discussions about ‘skilled nursing’ are often complicated by confusing and misused terminology. Think of ‘skilled nursing’ as dealing with 3 kinds of patients: (1) Long-term, acutely ill ‘custodial care’; (2) Transitional Care; (3) Rehabilitation. Currently, chronically ill patients are not usually housed in facilities operated as ‘transitional care and rehabilitation’ units. These ‘rehab’, short-stay units have a goal: GET OUT OF HERE! ‘Transitional Care’ is designed to help patients build strength and skills totransition into the next phase of recovery—hopefully, from the hospital to back home. ‘Rehabilitation care‘ crosses all age lines and “retrains patients to compensate for specific lost functions”. With all the changes, improvements, and discoveries in health care (hip/knee replacements, etc. ), is there any wonder the function of the ‘Nursing Home’ is changing? As pointed out earlier, simply using the nomenclature ‘Nursing Home’ can cause confusion. of food, clothing, wood, etc., to individuals living independently. As a result, all kinds of people—the physically incapacitated, orphans, the mentally ill and insane, etc. ended up living in Almshouses. Not only were ‘more worthy’ elderly people moved from the Almshouses, but other groups started providing for young people, the blind, the insane, etc. By the 1920’s nearly 70% of all residents in Almshouses were the elderly poor. In an effort to abolish these hated institutions, the new federal legislation barred any almshouse resident from receiving financial support (residents of privately funded Homes for the Elderly and Infirm could be beneficiaries of pensions). Now that the Federal Government had come to the rescue of public housing for displaced old, helpless people, what could possibly go wrong? Can you imagine how surprised the bureaucrats were to discover they had overestimated the impact of pensions on the lives of the needy elderly? Most had simply assumed that, with monthly annuities, individuals could live independently. A man before his time, aging advocate Homer Folks, argued that only about 15 percent of the almshouse population were in the institution because of strict financial need. “The others,” he explained, “are physically infirm and sick, and have various kinds of ailments that require personal attention of the kind that you could not get in an individual home; [they] require nursing or medical attention . . . in some sort of institution.” No one wanted to hear that; they didn’t listen. Despite its relatively small inmate population (3% of the elderly), the almshouse stood as a visible sign of a despised welfare system; the institution was doomed and The Federal Government set out to see that it was eliminated. By barring almshouse inmates from payments, aged individuals in need of long-term care were forced to seek shelter in private institutions. In true Government fashion, the States reacted: Immediately following the enactment of Social Security, officials transferred well-established county homes into private control, although neither the residence nor its supervisors changed. The goal was simple: The inmates could now be classified as recipients of private care, and the institution was able to receive residents’ monthly annuities from the Federal Government. By the 1950’s, unable to operate without federal annuities for the inmates, the intent of policymakers to destroy the hated almshouse had succeeded. Unfortunately, there were still many sick, old people who needed help. In 1954 Congress passed NEW laws that allowed for the development of public institutions for the most needy older adults. For the first time, both public and private nursing-home residents were granted federal support for their assistance. As Homer Folks had predicted, not all elderly individuals could be supported in their own homes with monthly pensions; many incapacitated older adults required long-term care. In shutting the almshouse door, policymakers gave birth to the modern nursing-home industry. In 1954 the Hill-Burton Act provided Federal grants for nursing homes built in conjunction with hospitals which, unfortunately, resulted in nursing homes modeled after hospitals. In the late 50’s, SBA Loans were made available for stand-alone nursing home construction. The passage of Medicare and Medicaid in 1965 provided significant impetus to the private-industry growth of nursing homes. In the 15 years between 1960 and 1975, the number of nursing homes in the United States increased 140%, nursing-home beds increased by 302%, and revenues rose 2,000%. By 1980, 80% of all institutionalized elderly resided in commercially run nursing homes. In the late 1960s, after an overly enthusiastic response to Medicare, the then-Department of Health was forced to discontinue much of the coverage for nursing homes the programs had initially allowed. During the 1970’s, abuse occurring in nursing homes became a national scandal. These commercially operated ‘Park and Die’ facilities had similarities to the long-forgotten almshouses in that people feared being forced to spend their final days in these institutions. Relatives felt guilty for abandoning their elders to nursing-home care, and the circle was complete. In 1972, the Federal Government enacted specific requirements for nursing homes supported by Medicare and Medicaid. This had the immediate impact of reducing patient reimbursement for most individuals seeking to enter skilled-nursing facilities. Although not the intent, this legislation had the same result as today’s ‘disruptive technology’ by inadvertently increasing the demand for intermediate-care facilities. The ‘Assisted Living’ industry was born. By 2000, nursing homes had become a 100 billion dollar industry, paid largely by Medicaid, Medicare, and resident out-of-pocket resources. Although only 2% of all elderly individuals between 65 and 74 resided in such institutions, the proportion of those aged 84+ increased to 25%. Today, nearly 6% of older adults are sheltered in nursing homes that provide a wide range of care (see first blog of series). The problems still facing long-term, custodial care for older adults are clearly tied to its historical development. If not maintenance care for the terminally ill, what then? Basically, in a word, GOVERNMENT is all that’s needed to understand nursing homes throughout the 1900’s. By mid-century, federally-funded financing (say that fast 3 times) became available creating a for-profit nursing home construction boom. Once government service/money becomes available, people getting along one way or another without government assistance will come out of the woodwork. In 1956 the OAA (Old Age Assistance) payment cap was lifted and continuing changes in Social Security Law initiated reimbursements directly to operators as opposed to individuals. This meant a reliable income stream, and because Medicare and Medicaid were suddenly unlimited sources of risk-free reimbursement, a thriving industry was born as publicly-traded nursing home chains became some of the hottest commodities on Wall Street. In 1965 only a few publicly-traded nursing home chains existed. Beginning in 1969 there were 58, but by the end of 1970 there were 90. The best known were called the “Fevered Fifty”, promising returns of 20-25% a year. The bottom fell out in 1971 because of the usual suspects—greed, fraud, insider trading—and a new culprit: regulation of the industry. Additionally and not surprisingly, with government financial spigots open wide and few restrictions on what nursing homes should look like or how they should operate, quality-of-care (lack thereof) became a real public-relations issue. There was also a new, really insidious problem afoot. State Hospitals of the time housed the mentally ill without Federal Funding. Medicaid, however, matched State funding for Nursing Home patients. This incentivized local and state government to shift the fiscal burden (and bodies) of the mentally ill from State to Federal auspices. Thus began the ‘transinstitutionalization’ of patients. In 1980, 44% (750,000 people) of the nursing home population had serious mental illness. 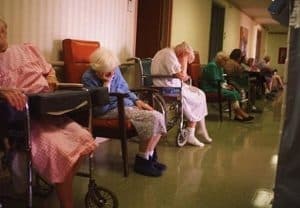 By 1990, the Omnibus Budget Reconciliation Act legislated provisions requiring pre-admission screening of nursing home applicants to prevent the inappropriate placement of the mentally ill. About this same time, The Nursing Home Reform Act of 1987 began kicking in. This increased the percentage of free-standing (not part of a hospital) nursing homes providing physical therapy, speech and hearing therapy, occupational therapy, and nutritional services. By the early 90’s, nursing homes increasingly served as a ‘release valve’ for hospitals, permitting more rapid discharge into a setting where patients could recuperate in controlled circumstances. Assisted living facilities also began to emerge, thus providing alternative residential-care settings. By 2000, segmentation of the market had begun, with an increasing share of post-acute patients being treated in stand-alone facilities specializing in rehabilitative care. The US Census noted between 2000 and 2010 a 20% reduction in the number of seniors living in nursing homes. This trend may partly reflect a growing preference for alternative settings for long-term care, but Medicaid funding plays a big part. In 1990, 13% of such funding was for home and community-based services. That number is over 45% today. Respected surveys taken over the last 30 years have found a consistent 33% of Americans who say they would rather die than live in a Nursing Home. Yet, in 2010, Medicaid alone forked over $130 billion (31% of total Medicaid spending) for long-term care. Does anybody but me see a disconnect here? Rincon del Rio is a rare voice championing Palliative Care, which is a linchpin in our quest to achieve Abundant Living, Successful Aging. Watch for some acronyms you may not know: PACE, IRFs, LTAC, SLP, and new ones you’re going to begin seeing. Also be prepared for the disappearance of some old acronyms you did know, like traditional multi-purpose SNFs as Medicare demands increased efficiencies. In the future, it would be good to have a working knowledge of abbreviations like POLST, ACAS, ACAT, RADs, ADLs, DNRs, and so on. Unfortunately, you may see new Sub-Acute Units (replacing maternity wards, I suppose) in local hospitals. Look for more employer-sponsored LTCI (long-term care insurance), and new product offerings with traditional LTCI replacing CCRC entry fee models. But this Iknow (and you can take it to the bank): Future long-term elder care in the United States will consist of services consumers want and payers will be willing to pay for. What that will not be is in-patient care in hospitals or nursing facilities, and it is certainly not long-stay nursing homes. What the future of long-term care will involve is fully-comprehensive service models. One frequently asked question about Rincon del Rio is what the continuum of care will cover. I explain whatever is needed for abundant living and successful aging will be provided. I often joke that if it’s a ‘burn day’ we can handle it all. I also think it is safe to predict a bigger-is-better trend coming to the long-term health-care industry. With government reimbursements shrinking, scale is all-important. In markets where the population can support them, look for large providers to supply the fullcontinuum-of-care: In-patient hospitalization to post-acute and rehab services—even in-home care and more involvement in hospice. In areas where demand is lacking, large providers will abandon brick-and-mortar facilities to concentrate on technology services and at-home health care—or they will just abdicate to local hospitals. No matter what the future holds, residents of Rincon del Rio can set these worries aside and enjoy an active, happy lifestyle. We’ve got you covered. What is Service-Enriched Housing for Seniors? What is a Multi-Level 55+ Community?